Look! Up in the Sky! It’s a bird! It’s a plane! It’s a Super-mess! 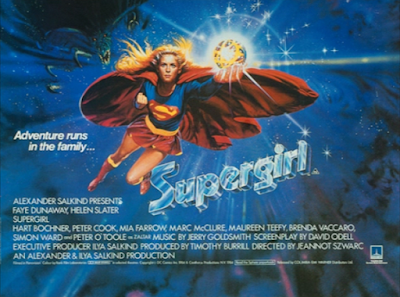 I can’t think of another movie quite like 1984’s Supergirl. Just a few years earlier, Warner Brothers and Alexander and Ilya Salkind had achieved massive success in bringing Superman, the world’s very first superhero, to the big screen. Unfortunately, the subsequent sequels had brought diminishing returns, both creatively and financially, thus Supergirl feels as if it were made to breathe some fresh air into the Super-franchise and do something completely different. Well, it’s different alright. A few things work in Supergirl, but a lot of things don’t. The biggest thing working against this movie is that it just doesn’t make any sense. The plot feels like it came to the writer (David O’Dell, The Dark Crystal, Masters of the Universe) in a dream after a night of eating gas station sushi. I can only speculate, but it feels like there may have been substances involved. Track with me here: our story begins with a bunch of Kryptonians (including Superman’s cousin Kara Zor-El) hanging out in pajamas inside a big white building surrounded by plastic wrap. We’re introduced to Zaltar (Peter O’Toole) who is using something called an Omegahedron (because OmegaMcGuffin had too many syllables), which we learn has the power of creation. Before you know it, the Omegahedron has torn through the plastic wrap around wherever this place is and is on its way to Earth. Kara ends up following it, and arrives on Earth now fully transformed into Supergirl, complete with costume and cape. No explanation is given as to how this happened while she was travelling or what place she had just come from (we later learn that the white building is called Argo City), how it survived the destruction of Krypton, and what all these Kryptonians are doing just chilling in their jammies. It’s a wacky way to introduce us into this world and to these characters. The Omegahedron ends up in the hands of Selena (played by Faye Dunaway, always lit as if she’s in a movie from the 1930s), a novice witch who uses the Omegahedron to wreak all sorts of havoc. 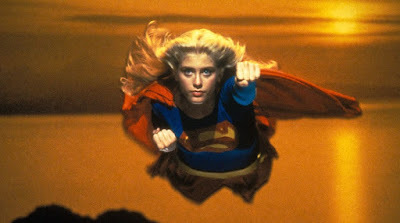 Helen Slater makes her screen debut as Kara/Supergirl and her civilian secret identity Linda Lee. Did I mention that when she’s in her Linda Lee disguise, she switches her hair color brown with mind powers? Anyway, Helen Slater is actually pretty good in her first role, though she does occasionally seem doe-eyed and overwhelmed. It works for the character, who finds beauty and wonder in the mundane. No one would say that it’s a powerhouse performance, but it fits the character, and she seems truly heroic when she’s doing super things. There are many problems with Supergirl, but I don’t think Helen Slater is one of them. I dig her. The rest of the cast is strong, though they aren’t given a ton to do. In addition to Helen Slater, Peter O’Toole, and Faye Dunaway, we also get performances from Peter Cook, Mia Farrow, and the always-watchable Hart Bochner (Die Hard). Maureen Teefy plays Lois Lane’s little sister, Lucy Lane. Rounding out the cast is Mark McClure as Jimmy Olsen, the only character to cross over from the Superman films. Christopher Reeve was scheduled for a cameo, but had to “bow out” at the last minute. At least, that’s the story; the rumor is that he bailed when he saw how bad the script was. In the end, the only glimpse of Superman that we get is through a poster hanging up in Kara’s college dorm room. Nevertheless, this cast is really strong, but ultimately wasted. It’s hard not to feel like O’Toole, Cook, and Dunaway are slumming, but perhaps they were pursuing the same thing as Marlon Brando in 1977’s Superman. As to what that is, I don’t know. Perhaps a paycheck. 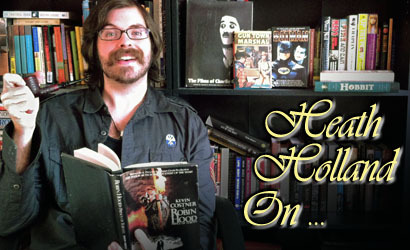 Cook is an incredible English comic actor, yet he gets very little to do as Dunaway’s warlock pal/rival. The real standout is Hart Bochner, an actor I’ve enjoyed in everything I’ve ever seen him in. He’s always approachable and charismatic, and could ALMOST talk a European terrorist out of harming innocent people at an office party gone wrong. This movie’s decision to pit Supergirl against a witch is a bold move that could have paid off had the screenplay been a bit stronger. Sure, I get the thinking behind it; we’d seen Superman fight villains from The Phantom Zone and Lex Luthor, so this movie attempts to bring a new kind of villain to the table. Besides, if you’re a comic book fan, you know that Kryptonians are vulnerable to magic. It’s one of the few weaknesses (in addition to Kryptonite and apple pie) that they have no defense against. Witchcraft could have worked really well here if it had been played as more of a threat, but it just feels really campy. Supergirl, it seems, is more interested in being a comedy/fantasy than an action/drama. Another thing working against this movie is the lack of action. We don’t get to see Supergirl being a hero until roughly halfway into the film, and even then it’s to save a town from a runaway tractor. To be fair, the tractor sequence is my favorite segment in the whole movie because it’s the only time I really feel like this character is doing what she’s supposed to be doing. Plus, there’s a ton of blatant product placement for Popeyes Chicken. Love that chicken from Popeyes! I bang this drum a lot, but these problems arise when movies about superheroes second-guess the source material and feel they have to transcend and/or distance themselves from that source material rather than embrace it. Thus we have a superhero movie with zero supervillains and not a single super-fight. Never underestimate the people’s willingness to see two powerful people fight each other. That shouldn’t be your entire movie, but it’s a nice hook to hang a story on. A superhero movie without a big smackdown is like a revenge movie without Liam Neeson. Why would you even bother? It’s not all bad, though. The movie is at its best when it follows Kara doing cool things, saving people, and balancing her private life with her public persona. There’s something magical (no pun intended) about watching her soar through the sky and fly over cityscapes. That’s what this character was created to do, and it’s always great to see her being super. When the movie lets her be Supergirl, it really works. They even attempt to have her go up against a gigantic monster summoned by Dunaway at the end of the movie (which does not culminate with a satisfying super-fight). The sequence is unfortunately hampered by poor special effects, but I give them credit for trying to bring in a monster, which is something we hadn’t really seen. We even get to go inside the Phantom Zone! I also have to tip my hat to the sweet Jerry Goldsmith score. The Superman movies got that awesome John Williams theme, but Jerry Goldsmith is no slouch, and I like what he does here. I found myself humming the theme after I’d watched this movie, which is always a good sign. Perhaps not so oddly, there are no less than SIX cuts of the film floating around different parts of the world, masquerading under the guise of “international cut” and “director’s cut.” There’s even a “TV cut” with a bunch of added footage, but with the curse words replaced. Which one you see apparently makes a big impact on your overall viewing experience. The one that seems to be the most recommended, though, is the 132-minute version, which leaves in a bunch of character stuff and lets certain moments breathe. So in the end, Supergirl doesn’t really succeed like it could have or should have. Part of it is probably the fault of the director, Jeannot Szwarc, who had previously directed Jaws 2 and who would next helm Santa Claus: The Movie, which, come to think of it, often feels very similar to this movie. He doesn’t seem like the right choice to bring a very popular DC comics superhero to life, nor does David Odell seem like an obvious choice for the script. But we (I) have to remember that the comic book movie genre was still very much a new thing back in 1984, and I commend the movie for trying to do something different and not throwing Supergirl against the same foes her cousin fought in his own movies. We also have to give this movie credit for being essentially the first female superhero movie. Sure, Wonder Woman had been on TV for years, but she never headlined her own feature film (and still hasn’t, as of this writing). It also casts a woman, Faye Dunaway, as the main villain in a position of power over her nearest male colleague, and I’m pretty sure her character is a lesbian. It’s never called out, but it seems pretty heavily implied, which was pretty progressive for 1984. With all these things considered, the movie can ALMOST be forgiven for making Supergirl’s main weakness her affection for a man. 1984 was a legendary year for movies, and it gave us a bunch of classics that have stood the test of time. I don’t think that Supergirl is one of them, but that doesn’t mean it has no place. We need strong female heroes, and we need Supergirl in our society. It’s worth mentioning that the character has found renewed life on television in a new series in which Helen Slater occasionally appears. I’ve been kind of hard on this movie here, but I actually do like it and think it filled a big gap when there was nothing else like it. It can be hard to watch now, but it’s not without charm, nor without small successes. No, we need Kara, and as long as there’s a place for her, there’s a place for an odd little movie like Supergirl. Never seen it but now I kind of want to. Why would a bother with a revenge movie without Liam Neeson. If it was a revenge movie with Clint Eastwood. You don't mess with Clint when he has vengeance on his mind. So are you saying that the guy who COOKed up the script is a real O'TOOLE and should be DUNAWAY with? Could you say it into this microphone? The one and only time I watched Supergirl was the right time - I was about 10 so young enough to not quite see how silly it was but old enough to get a funny feeling in my pants when Supergirl was onscreen. WOW - Helen Slater looks great and might be the most convincing looking comic book character in film up to that point. Yeah, better than Reeves somehow. I gotta say you've made me want to watch it again - good review - tough but fair!